What do you get when you combine jalapenos, cheese, and chicken? Jalapeno Popper Chicken, that’s what! Let me tell you, this stuff is warm, filling, and unbelievably good. Using a small knife, cut a pocket in the side of each chicken breast. Season each breast with salt and pepper to taste. In a small bowl, stir together the cream cheese, Greek yogurt, jalapeno peppers, green onions, and cheese. Stuff each chicken breast with the cream cheese mixture. If needed, use toothpicks to help secure chicken. In a shallow dish, whisk together the egg and milk. 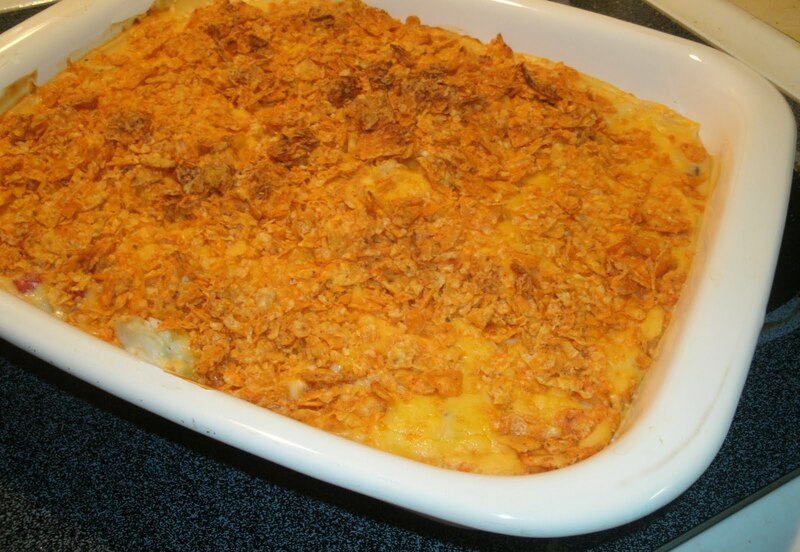 Dip each chicken breast into the egg/milk mixture, then in the crushed Ritz crackers. Place in a baking dish that has been lightly coated with cooking spray and bake for about 40-50 minutes or until chicken is done. With our warmer temperatures, it takes a little longer for Fall to actually get here, but when it does, it arrives in a riot of beautiful colors. Wait a minute. . .
Brownie: I’m Fall colors, too, aren’t I Mama? Me: Yep, you sure are, Brownie Girl. Me: And you, too Little Man. Me: Um, not quite. . . but you can be an honorary mention since you’re Bryony’s goat buddy. Speaking of Bryony, she enjoyed a good romp in the leaves today. That’s my girl! A leaf chewing fiend. I am a huge fan of Mexican/Tex-Mex cuisine of any type – flan, chimichangas, chile rellenos, sopapillas, anything with tomatillos, etc. In fact, if I never had to eat any other type of cuisine, I’d be perfectly happy. But I can’t stomach Mexican fast food, so I started making my favorite dishes at home years ago. And even though a ton of really great, authentic Mexican restaurants have opened up in our area in the past several years, I still enjoy doing it myself. * I make this with both wheat tortillas and wheat flour, so mine may appear a little darker. 1) Stir together all of the ingredients and store in a sealed container. 1) Heat about 1 – 2 Tbsp of vegetable oil in a large skillet on medium heat. Add the diced onions and bell peppers and cook until the onions begin to turn translucent. Then, add half of the diced chiles, all of the shredded chicken, the taco seasoning (I usually add about 2 – 3 Tbsp to the chicken mixture), and salt and pepper to taste. Stir together well. Add about half of the reserved chicken broth and about 1/4 cup of milk or cream. Stir together, and allow the mixture to simmer for a few minutes. Remove from heat and set aside. 2) In a smaller skillet over medium heat, melt the butter, then whisk in the flour. Allow it to cook for a couple of minutes. Then, add the remaining chicken broth and about 1/2 a cup of milk or cream. Stir together well. Now, stir in the taco seasoning to taste (I usually add about 2 -3 Tbsp to this, as well) and add the rest of the diced chiles. Stir in the sour cream and about 1/2 cup of the grated cheese. Let the sauce simmer until the cheese has completely melted. Season with salt and pepper to taste. 3) Microwave the tortillas for 30 seconds so they’re more pliable. Place a couple of large spoonfuls of the chicken mixture in the center of each tortilla, sprinkle a little cheese on top, and roll the tortilla up. Place each rolled tortilla in a baking dish, seam side down. 4) Pour the white sauce on top of the rolled tortillas. Sprinkle a little more cheese on top and bake in a 350F degree preheated oven for about 20 – 30 minutes. Just before going in the oven. I like a little fresh salsa with enchiladas. I bought a new stock pot to cook Chicken and Dumplings in next week because the old one had begun sticking very badly. Of course, I just had to test it out (afterall, it wouldn’t do to ruin a whole pot of dumplings on Thanksgiving Day just because of untested cookware). 1) In a pot, boil the chicken in water. While it’s boiling, make sure to season the water with salt and black pepper. Once the chicken is done, remove it from the broth and allow it to cool, then debone it and either shred or cut it into large bite-sized pieces. Strain the broth. Just after adding the noodles. 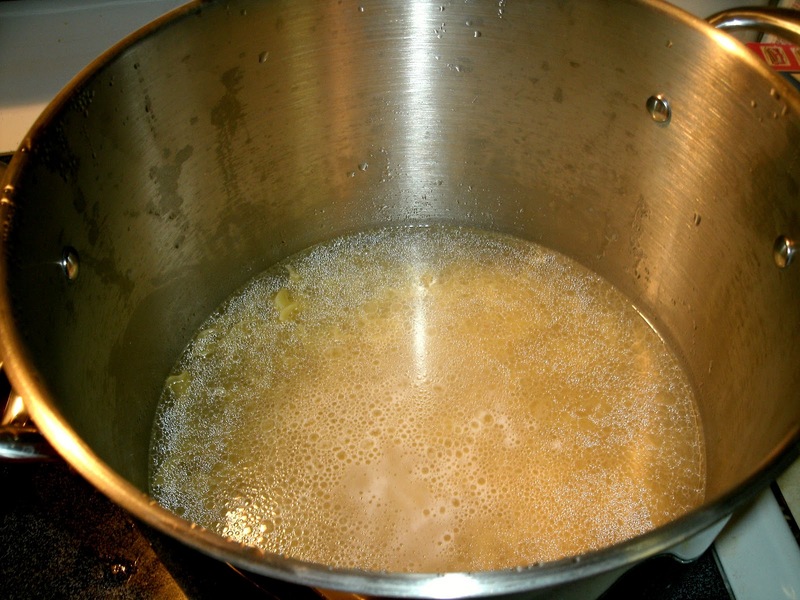 2) In a stock pot, combine the chicken broth and 2 cups of water. Bring the broth back to a boil and add in the egg noodles. Just after adding the chicken and onions. 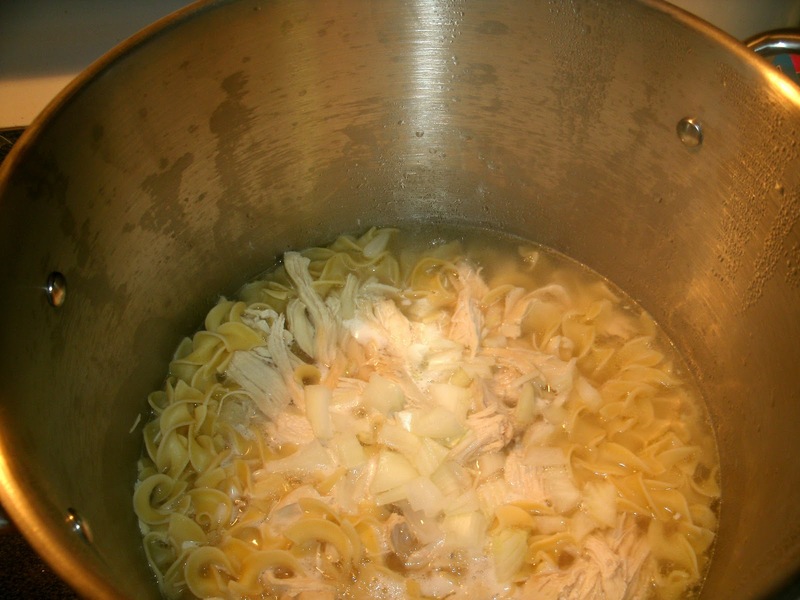 3) Allow the noodles to cook for a few minutes, then add the chicken pieces, onion, cream of chicken, and cream of celery. Make sure to stir in the cream of chicken and the cream of celery very well. Just after adding the carrots and English peas. 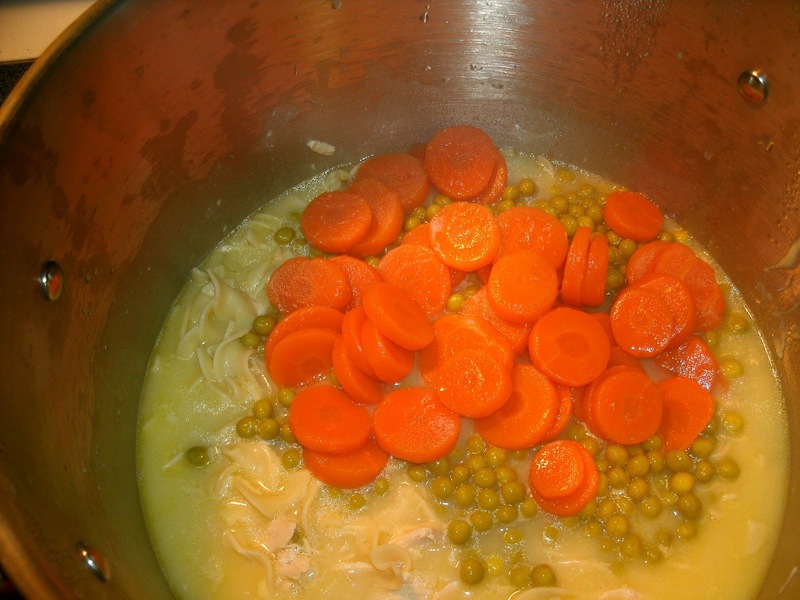 4) Stir in the carrots, English peas, and the hard boiled egg slices. At this time you can season the Chicken Wiggle with a little more salt if you want to (because there are a few canned foods in it and the broth has salt in it, too, I usually only add a small amount of salt or none at all towards the end; so make sure to taste it before you add any, just in case). Allow the Chicken Wiggle to simmer on medium heat for about twenty minutes. Just before it’s done, you can add a little more ground black pepper (we like quite a bit of pepper in ours, so the amount I usually add is about 7-10 full turns of a pepper mill). A hot bowl of Chicken Wiggle. Mexican Chicken – My mom’s favorite! One of my mother’s favorite dishes is a simple variation on the King Ranch Chicken recipe. I don’t know why, but Mama (I admit it, I still call her Mama) who doesn’t like cheese or hot peppers and will not eat dishes containing either, loves Mexican Chicken. She’d probably eat it two or three times a week if she could get me to cook it. I’ll admit I haven’t cooked it in a couple of months. So, one night last week, Mama had had it, and she put her foot down and demanded I fix her favorite dish for supper. Allright. . . allright, I’m exaggerating. She didn’t quite do all of that, but she did go grocery shopping and have all of the ingredients waiting for me that afternoon. I took it as a subtle nudge that that was what was for supper. One of the main ingredients, chicken. 1) I usually boil the chicken, seasoned with salt and pepper, of course, but you can also roast it if you want. Then pull it off the bone and either, shred it or dice it into bite-sized pieces. 2) Crush the tortilla chips, then spread evenly into a casserole dish. Make sure to reserve some chips for the top of the dish. 3) Spread the cooked chicken evenly on top of the chips. 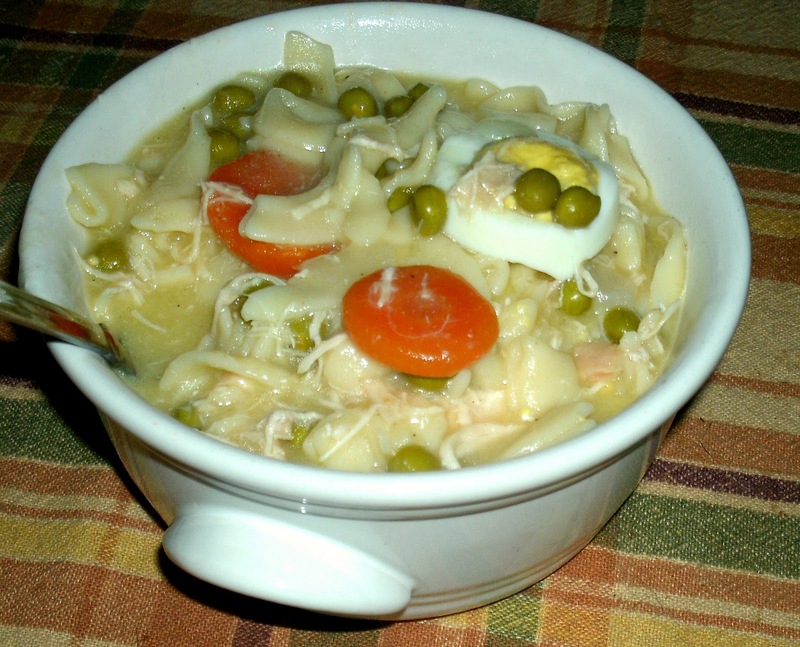 4) Combine the cream of chicken, cream of mushroom, evaporated milk, & the Ro-Tel tomatoes & green chiles. Then, spread the mixture evenly on top of the chicken. 5) Sprinkle the shredded cheese on top. 6) Top with the remaining chips. Bake in a 350F preheated oven for about 30 minutes (give or take) or until the chips just begin to brown & the cheese is melted.